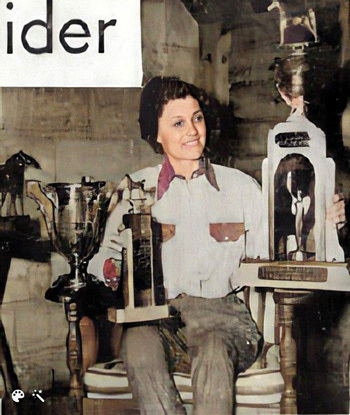 Hilda Bryson won many prizes at horse shows back in the 1930's and 40's. She and her husband Lee and daughter Margaret Carolyn lived a half mile south of Minonk on old Route 51 where she had a stable of horses. 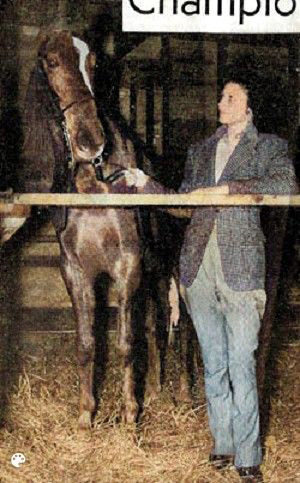 Hilda became an expert horseman in spite of criticism from a veteran trainer. In an interview with the Pantagraph Hilda said that he told her, "You fall the longest and still never fall off more than anyone I ever saw". That criticism made her mad and, determined to succeed, she rode any horse she got a chance to mount. She went on to win numerous trophies during her riding career. Hilda with Gypsie in 1935. Hilda admires the governor's trophy won at Fairbury in 1944. 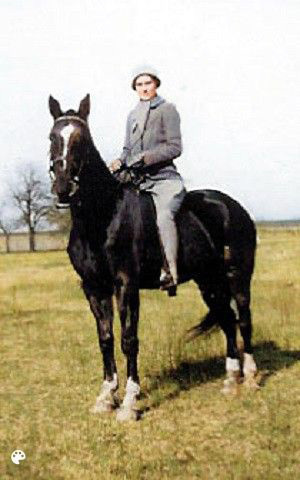 Horse pictured here is "Wing Commander", one of Hilda's two 5 gaited horses.